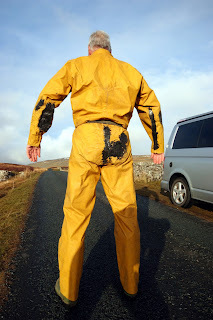 After the failure of Petzl to design and build a caving suit that fits a six foot bloke there was nothing for it but to repair the old one. Following the advice of Dave in Inglesport a tube of Sikaflex was obtained and the old Meander suit repaired. So here, in true Inglesports pose is the outcome of the repair! 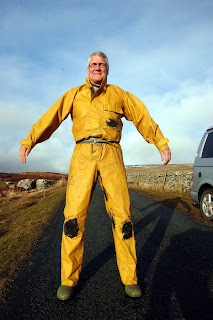 Come on Petzl, this is what a six foot caver looks like, design an over suit that fits or Meander start making them again! So, today's trip was down Kerplunk with Kate and Joe and Sharon making their second appearance of the season. This is a better meet attendance than TNC members Phillips, Garner, Whiting and Jardine by 2 trips! Kate thought that the climb down the Kerplunk shaft was one of the most exciting things she had done in a while! On arrival at the main stream way we were unsure what to expect as the rain had been falling heavily right up to when we started to get changed when suddenly the sun came out! 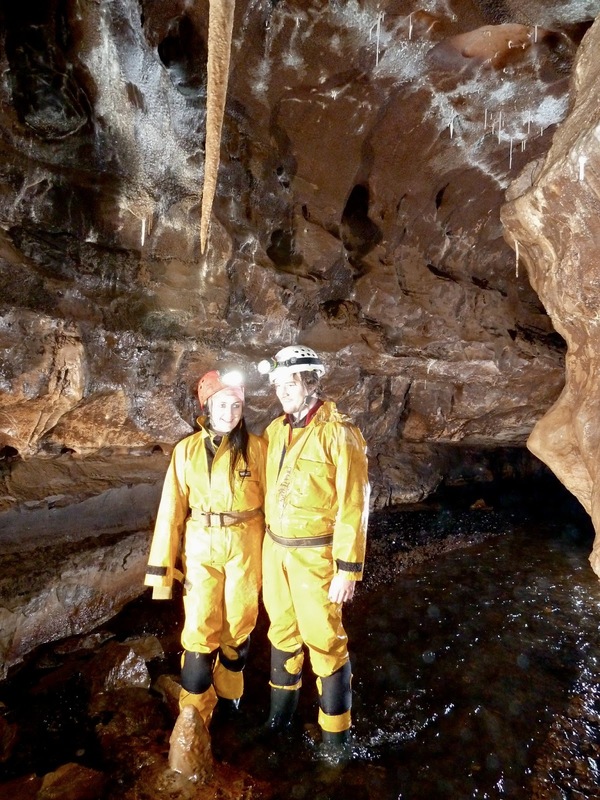 As it was, although swollen the water level was OK.
Kate and Joe threatened by Vlad the Impaler . The water was freezing due to snow melt. Time to head out. Despite concerns from certain members about the climb out, it went quickly and soon people were popping out of the entrance. The references to cave dwelling spiders that are 'mildly venomous' while climbing out gave Kate some added impetus to ascend quickly! Waiting for the last members to exit. A quick walk back to the car and change saw us sitting in front of the fire at the Snooty Fox enjoying a pint of Landlord.